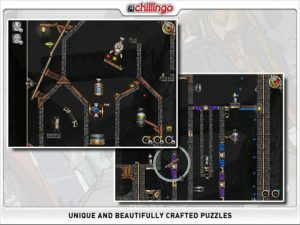 Master of Alchemy HD is an engaging puzzle game by Chillingo that’s reminiscent of ragdoll blaster, minus the morbid “throw dolls around” element. Instead the elements are solid, liquid, and gas, and it’s your job to implement the right tools correctly so the chemicals execute a goal. This sort of manipulation relies on a series route changes and tools that each have a different function. 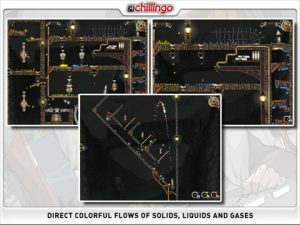 In the beginning the puzzles are easy, but in time the challenges become more difficult as you must break through walls, gather gems, or create more than one element in the context of a single puzzle. Then you’re given a generic hint, something that reminds you of the function of a certain tool or enlightens you as to the importance of a certain part of the game. After that the game is all yours, and after you achieve the sought after element you’re given a critique like (mediocre, reasonable, etc) and a score before heading off onto the next level. 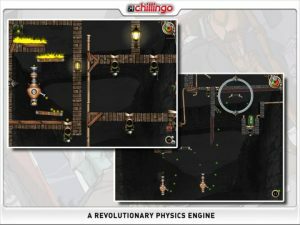 Each level gives you the opportunity to win a series of badges for completing the puzzle in a certain amount of time or saving enough precious elements, and more. When you fail to earn them within the level, a screen informs you of your failure. The silver and bronze time badges seem to ding off too close together (it feels like seconds), but this is a minor point and just an opinion. 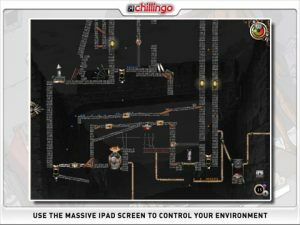 The nuances sound difficult to pick up on, but even if you’re not interested in paying careful attention to every little detail you can still find your way around the puzzles after completing the in app tutorial. All said and done, the physics engine on this game is nothing short of impressive. Each particle interacts with the tools you use with amazing accuracy. When you create the right element and start dropping it in its final container, the container lights up and the icon at the lower right hand corner starts counting down the number of particles you need before you’ve completed the puzzle. When it comes to actual execution of Master of Alchemy, the game is incredibly thorough and nicely executed. The overarching mood is dark and cryptic, and the music is subtle but good. Even the sound effects that evoke bubbling beakers and everything else, are incredible. Integration with Crystal that allows you to track your score against competition is also nice, and the app gives you the opportunity to become a character and save your personal profile in the case of multiple users. Each profile displays your name, avatar, last date used, progress out of the 60 puzzles, and your overall status (e.g. Scholar, Amateur Alchemist, etc). Whether you’re competing to achieve high scores, get all the medals, or just solve all 60 puzzles, this game is definitely something that takes time to solve. Master of Alchemy is a game that’s nice to have for the those in between times, as well as a calming escape that could take over an half hour or so of many an afternoon. Bottom Line: Master of Alchemy is a well thought out puzzle game for the iPad. It’s the kind of thoughtful game that’s fun to refer to and easy to get lost playing.